POSTPONED MY SABBATICAL FROM THE P.G. 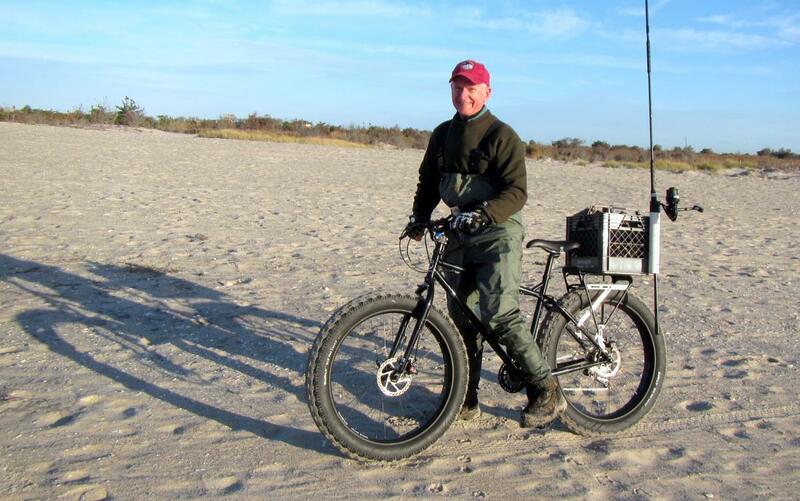 As stated in my earlier thread, I am going to outfit a relatively cheap fat-tire bike to cruise the beaches of southeast Florida in search of fish. This thread will be a sort of how-to for any who want to follow in this path. I will also appreciate any helpful advice for those who have BTDT. For the haters who will complain about anything I write, up yours. The idea is two-fold, find/follow bait/game fish and to get to beaches either far from parking or behind private residences with no nearby public access. Unlike up north with boulder fields that can be counted on to hold bait and stripers at the right times, fish down here are much less predictable. Thus, you have to find them many times and that requires covering ground. Same deal with inlets which can provide all sorts of structure and currents but require a serious walk from the closest public parking access. And while our inlets are not nearly as long as the CCC, they can be a half mile long and fish can bust anywhere at any time. So this is about being able to cruise up and down the beach, probably no more than 2 to 4 miles on any given trip. The goal is to assembly a bike and rack package that can cruise across the sand much faster than I can walk while carrying a couple of rods and all the needed supporting gear. Clearly this is not a new concept because people of been using bikes for fishing purposes for decades. Canal bikes and boardwalk cruisers are common. What is new over recent years is the popularity of cruiser or mountain bike styles with tires that are 4 to 5 inches wide. These fat tires, particularly at low inflation, allow riding over sand with relative ease that’s not possible with thinner, more traditional tire widths. This bike is going to be dedicated strictly to this activity. If it is to be used off of the sand it’ll be riding the streets around my neighborhood and maybe the relatively flat single-track we have through some parks here in South Florida. We have no hills and even if we did at my age I have no desire to ride trails with serious inclines, fast downhills and lots of switchbacks or other mountain bike classic train. I have a bike rack for my truck and I will park in my usual spots and prep the bike there. I do not plan to ride to the ocean beaches from home, even though that is 4-6 miles one way. I might use this to ride the mile or so to the local ponds that hold LMB but that is an ancillary use. This is a proof of concept given I don’t know how much I’m going to use it. I have not ridden a bike with any regularity in 20 years and while I try to stay in shape, how much I might use it is unknowable. Thus, I had to set a reasonable budget that would allow me to test the concept without investing a silly amount of money. 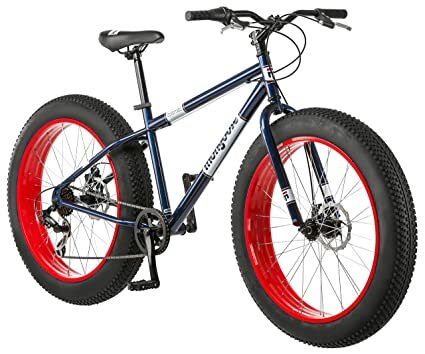 Anyone who knows fat tire bikes knows that you can’t really get into a decent bike until you spend $800 (online vendor) and well over $1000 for a really good, name-brand bike from the local bike shop. And like in any sport, enthusiasts can spend up to $2,000 or more with the highest end components, carbon fiber frames, etc. And in serious and regular mountain biking, those dollars can be worth the investment. That is not the case for my flat, beach usage. So I set a budget: all-in $500 for this thing to roll on the sand, carry me and my gear, and not induce a heart attack. If I could spend $400 I’ll be even happier. So that comes out to $200-300 for the bike and the balance for the accoutrements. Looking around the Internet there are only a few options that could fit that budget. Clearly buying a used higher priced bike would be an excellent option and was the advice of a few SOLers in the other thread. However, after weeks of looking around South Florida, I could not find anything. Problem is, if they don’t sell many new fat tire bikes in this area, you’re not gonna find too many used. The one used Trek fat tire bike I found offered had the guy wanting 80% off of the current MSRP for a newly revised version yet he’s been riding his bike for two years; $1,200 was nuts. The best new bike I found at a LBS was the iRide Rocker made by Momentum (a Giant sub-brand) but that was $699 before the fishing-related upgrades. So this project is going to be based on a Mongoose available from Walmart (a “WalGoose”). Some people know or use the 7-speed Mongoose Dolomite which Walmart has offered for several years, most recently at $199. At 50 pounds out of the box, it is heavy as hell, comes with such low quality components and usually has to be lubed before the first ride. I was headed in that direction but noticed that Walmart started carrying the 7-speed Mongoose Hitch model at $249. The Hitch looks like a Dolomite except that it has drilled out rims, alloy hubs, thinner tubing in its frame. I don’t know if the heavy tires are different or not. I have read that the Hitch weighs ~44 pounds which is obviously lighter than the Dolomite. I will be picking up the Hitch over the weekend and taking it to the local bike shop for final assembly as well as immediate upgrades of certain components. Walmart offered final assembly for free but that would be a 7-10 day wait and done by a Walmart employee doing dozens of Christmas bikes. And I would still have to take it to the LBS anyway. This way, I will have a trained professional working on it out of the box. There are enough articles and videos on upgrading WalGooses to get a pretty good idea of what needs to go, either upfront or after some use. Using those sources, I have culled the list to those to make this a serviceable beach bike but not try to make it into a trail-bike. So I will be limiting my initial upgrades to items which are either going to improve functionality or reduce weight, leaving hard trail riding and aesthetics behind. Apply Frame Saver or similar. I might replace the seat with some better but I want to sit on the stock seat first. The cost of the above is under $100 for the parts. Not sure what labor will be until I get it to the shop. None of the above appear to be critical for riding flat sand. My weight reduction goal it to get 3-4 pounds off with just the upgrades planned, but that might be ambitious without replacing the factory tires and tubes. They are reported to be quite heavy but quality tires and tubes could easily run another $100 and I can’t justify that right now. If the factory tires provide too much rolling resistance, etc. then I might consider it. 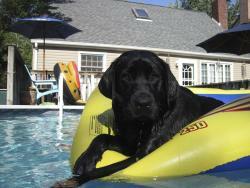 I have read that changing tires and tubes can cut six or more pounds off the total weight. I am more likely to replace the handlebars, headset and stem which can be done for $60 and save a couple pounds in weight. But not immediately. That’s it for now. I will continue to post here as the project progresses. That will include photos, details and prices of the components. Comments welcome from those curious or those who have been down this path and have advice. Never mind the weight of the tires, some of the heaviest pieces on that bike are gonna be the wheels. They are also gonna be crappy and not sure if they will accept the rotors for hydraulic brakes. As an ex bike mechanic and someone who rides mid-upper level bikes, sometimes it pays to bite the bullet up front. On the other hand, if you find you're not using it that much, you didn't blow $2K. Agreed on both fronts. The difference between the $199 Dolomite and the $249, while both have alloy rims, those on the the Hitch are drilled-out which will save some weight. Both models come with disc brakes from the factory so the rotors and frames will allow for brake upgrades. I found two guys who have added better stopping hydraulic brakes to their Hitches. And, if I do end up using this bike quite a bit, I can then upgrade to something a bit more upscale. Time will tell. And if I go that route, I either keep the Hitch for one of my sons to ride when they are home or just sell it as assembled to another local angler looking to do the same, but not wanting to take on the project themselves. Yup, there are costs and then there are COSTS. My wife thinks I am nuts, so there’s that factor as well. AND, my other winter project is building a 13’ 2-handed fly rod that, even with Redgreen’s concept, is still going to run $400. Did I mention that we are still buying lighting and furniture for a new house? BTW, right now Walmart has a price “rollback” on the Dolomite at $169, including delivery to your house or delivery to local Wallie World with free assembly. No such luck on the Hitch, which is still $249. No other seller has the Dolomite that low but that is the common price on the Hitch. FWIW, the Hitch at $249 is a rollback of its own from $299, or so says Walmart. Sam’s Club shows it out of stock by at $229 for members and free shipping for Plus members. You might want to pm Beerdoh he is a bike guy also has fat tire bike he might give you some good input! Hey Chuck, We've been talking on another thread. I think this is tomkaz official project/build thread. My goal is to replicate yakdog’s bike, though with a WalGoose rather than a Surly Pugsley. Steel frame on the beach, no beuno in my opinion. Even if you blast it with frame-saver, a cheap steel frame is gonna rust. I ride a lot, my best road bikes are steel, but it's the wrong frame material for your purpose. You're also paying a weight penalty. If I were building a fatbike for beach fishing, riding the kind of distances you describe, I'd go with an aluminum-framed single speed. Keep it as simple as possible. No derailleurs, shift cables, or handlebar shifters to get mucked up with sand. No rear gear cluster or triple ring crank that you don't need for flat beach riding. All that right there will save a bunch of weight. A quick search showed a couple of online options for under $400 with free shipping. ****, it might have just talked myself into giving this a shot myself! Good luck whichever way you go. Post up details of your final build. What you are saying is 100% true. I keep my gear in pretty good shape, will wash down and blow dry the bike after every use and reapply SaltX and other Protestants as needed (three times I typed protectants and iOS changed it, I am leaving it there). A single speed might be better, but I won’t know that until I use the 7-speed. All of the following have been purchased from Amazon which makes this incredibly convenient, especially with Amazon Prime shipping. GARAGE STORAGE - Space is tight and I have tall ceilings to going to hoist the bike up to ceiling when not in use. TRUCK CONVEYANCE - I have an existing Thule 4-bike rack (circa 2011) that attaches to my truck’s hitch. However, it is designed for traditional street bikes that have horizontal top tubes and won’t easily accommodate the diagonal tube on MTBs or the Hitch. This rack adapter attaches to the seat post and stem creating a horizontal tube to sit on the rack’s horizontal posts. Brilliant and saved me $200+ for a fat tire bike hitch rack. Attaching the crate to the rear rack can be done with hardware and parts I have on hand. My goal was a $500 all-in limit and it looks like it is going to be close. I doubt the bike shop can do all I am asking for $50. While I have the skills (attrofied from 30+ years ago) to do it all, I don’t have several of the bike-specific tools needed like thin metric spanners. Nor the experience calibrating disc brakes. And, no matter what, his time is still cheaper when you consider all the other factors.